Poco F1 only supports Widevine L3 which is only capable of streaming standard definition (SD) content. Poco F1 - also called Pocophone F1 in certain international markets - was launched earlier this month by Xiaomi's new sub-brand Poco. It was released as a powerful new smartphone with a mid-range pricing that undercuts even the affordable flagships in the market. However, the Poco F1 is lacking a crucial feature that will be disappointing for heavy multimedia users. It does not come with support for the Widevine L1 DRM, necessary for playing HD videos (720p and above) on most major streaming platforms including Netflix, Amazon Prime Video, Google Play. It only supports Widevine L3 which is only capable of streaming standard definition (SD) content. It is the lowest standard among the three - Widevine L1, L2, L3. Gadgets 360 has independently been able to verify this development, first reported by Indian blog Android Pure. 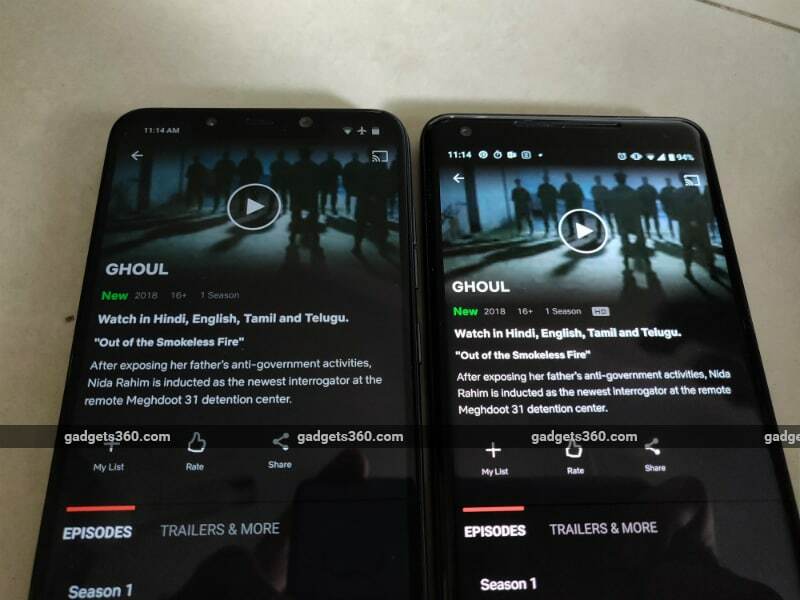 All Netflix titles show an HD icon on phones that support Widevine L1, and none on the ones that don't support the standard; the latter was spotted on the Poco F1. With Widevine L3, Netflix is capable of running videos only up to 540p in resolution. We have reached out to Xiaomi India for a comment and will update this space accordingly. Google's Android platform supports numerous DRM platforms such as ClearKey, Microsoft Playready, and more; however, Widevine is the most popular one used by streaming services. Widevine helps curb piracy of content from these platforms. This issue was previously observed in the OnePlus 5T back in December last year. Issuing a software update to fix this certification issue does not seem to be the way out, according to the Android Pure report. The Poco F1 has been launched in India at a price of Rs. 20,990 for the base variant with 6GB RAM and 64GB storage. The 6GB RAM/ 128GB onboard storage model has a price tag of Rs. 23,999, while the 8GB RAM/ 256GB storage variant comes in at Rs. 28,999. An Armoured Edition has been priced at Rs. 29,999. To recall, the Poco F1 sports a 6.18-inch full-HD+ (1080x2246 pixels) panel with an 18.7:9 aspect ratio and maximum brightness of 500 nits. It is powered by the flagship Qualcomm Snapdragon 845 SoC, coupled with up to 8GB RAM and 256GB onboard storage. In the camera department, the Poco F1 sports a dual rear camera setup with a 12-megapixel primary Sony IMX363 sensor, coupled with dual-pixel autofocus, and a 5-megapixel secondary depth sensor. On the front, the smartphone bears a 20-megapixel camera sensor with HDR and AI Beautify features. There is a 4,000mAh battery under the hood, with support for 18W charging (Qualcomm Quick Charge 3.0).